Another good week for us. I have the 3rd Highest average of the League for Men. We took 3 points and gave them 1 point tonight which keeps in First place. This week we are off for Easter but next week we bowl Team Holy Splits or as I call them the Bowling Wives. They are currently in 7th place. So I have been kinda quiet on this topic the last few months. It’s not that I don’t want to write about it, it’s more that it was still too soon and hurt too much to try and put it into words. January 21, 2013 was the beginning of one of the most difficult nights, that turned into weeks, that has stretched into months. Around 6:30 that evening my Dad called to tell me he was going to the ER as my Mom was being brought there by Ambulance. All I knew at the time was she was in a car accident, it turns out she hit a parked car in a parking lot. What eventually came to be was that she was driving home from work and an aneurysm had ruptured causing her to black out. Things could have been so much worse,but she thankfully wasn’t driving that fast as she was taking a corner, and had not yet reached the highway. The next phone call from Dad came around 9pm, they were transferring Mom to another Hospital in NY which is one of the best for NeuroSurgery. The hubby and threw on some clothes, jumped in the car and drove over to my parents house and picked up my Dad and drove to the other Hospital’s Emergency Room. This begins the Hours of waiting. My Brother and Sister-In-Law met us at the other Hospital and eventually the (cute) Surgeon came out and explained that there was an aneurysm that ruptured and my mom had a large amount of blood on the brain. They were going to go in and clip the aneurysm and clean up as much of the blood clot as they could. We followed the Dr through the ER and went up to the surgical floor and parted way with my Mom as they wheeled her into surgery around Midnight. Fast forward through hours of sitting in the waiting room, mostly in the dark, to 4 am when the Surgeon came out to tell us she made it through the surgery but it was too soon to tell how much damage there was and honestly what would happen as the first 24 -48 hours were up in the air, and still for the next 10 days things could go either way. She was heavily sedated for the next few days in the ICU hooked up to so many machines it was hard to tell which one was which. By Friday they had taken her off the medication that was sedating her and her vitals were all very stable. She was still not coherent but was showing signs of coming around. The Nurses in the ICU could not have been any better to her and to us. Slowly but surely the doctors and nurses removed tube after tube and the machines surrounding her disappeared. She was still not fully aware of everything but after days of heavy sedation and just the fact she had brain surgery it was understandable. She spent another week and a half in the ICU before she was transferred to a Step Down room where she stayed for about 27 hours and then to a regular room, where she stayed for a few days, mainly because a snow storm kept her from being transferred back to the local hospital’s rehab unit. By this time she was coherent although not totally sure of what day it was and had no recollection of anything that had happened. She recognized all of us but was foggy to say the least. This time was the most difficult for us as things could have gone many ways. We are very thankful to the Doctors and Nurses who helped my Mom get to where she is today. On Feb 11th Mom was transferred to The Rehabilitation Unit of our local hospital. This was a blessing on many fronts as it meant the end of the 45 minute commute each way to visit her, and that she was on the road to some sort of recovery. For the next 4 weeks she was to receive Therapy of all kinds, speech, occupational, and physical. I could tell she was getting back her senses cause she was complaining about the food. Her short term memory was spotty at best, she could only recall things as recent as Christmas. Once again the Nurses and Therapists were wonderful and treated not only Mom but all of us very well. They naturally got the good end of this since I delivered some fresh baked brownies to them twice. Once month after the transfer back to our home hospital Mom was then transferred to a Skilled Nursing facility on march 13th. The last few weeks have been better and slowly the family has been getting back to normal, well as normal as we can be. She had her own room for about a day and is now working on her second roommate. The first roommate was nice but had this awful radio that played awful harp music as loud as she could get it. She was working our last nerve with the music. I am unsure what is going on with the new roommate, although she is quieter than the rest I am not certain her time there will be very long. This past Monday Dad and I took Mom out on a field trip to see the Surgeon for a follow up and to have a food port peg removed that had been in for about 5 or 6 weeks. The Surgeons (the cute one and the head one) were very pleased and surprised at how far Mom has progressed in such a short time. There was a very good chance that she would not have made it this far and he said it honestly was a miracle things happened the way they did. In January he wasn’t really sure this follow up appointment was ever going to happen. Although she still has a long road ahead of her Mom continues to make small steps forward. They may be slower than the first few initial weeks where we saw progress every day but any movement forward is good. Her short term memory has improved a bit and she has since started to recall things that happened, like my Nephews Birthday, about a week prior to the incident. Her long term memory was better than mine some days. She was sure to remind us of things happening such as birthdays and stuff. Though she is still a little confused on the day of the week, she does know it is almost Easter and she has been recalling visitors that have come by. She may not recall what was for lunch or dinner, but with the food she has been eating some days I don’t blame her. We still have a long road ahead of us but things are far better than they were 60+ days ago. So that is the story of my life for last 2 1/2 months and the reason behind the less than stellar and exciting posts for most of Feb and March. What a Fantastic Week I had at Bowling. Although I wish the Hubby had been there to see it, he was off traveling for work. These scores are some of the best I have had in the last few years. With these scores I ended the night with a 612 series. This gives me the High Scratch Game (227) and Series (612), and the High Handicap Game (279) and Series (768) for the league. It was a good night all around for the Team as one of our other teammates bowled over 2oo in Game 2. This gives us as a team the High Team Scratch (704) and Series (1963) and the High Team Handicap Series (2602). We took all 4 points tonight which puts in First place for the first time this year. This week we bowl Team Alley Cats. Let’s see if I can bowl as well as I did last Sunday. Week #8 means position round. Starting Avg was 148. My average is still 148. Last week we played Team Fruits and Nuts. This week we play team Split Happens. They are in 1st place so if we can get enough points against them we can move up. Or in this case what a difference 2 years makes. We had the pleasure of meeting our friends Walt and Ken for lunch this past weekend. We get together with them every month or two for lunch, although we realized we hadn’t seen them since we went on the cruise in December. We had a fabulous time as we always do and spent a good 2 hours catching up and eating. So this morning I am checking my Instagram and I see the following picture posted, then receive said picture via text. Why yes Walt does enjoy taking pictures of me taking pictures of food. 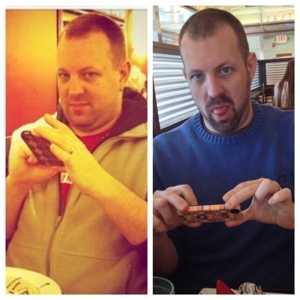 I haven’t talked much about it here but about a year ago The Hubby and I started an eating adjustment. We did not call it a diet, we occasionally refer to it as CAP (Carb Awareness Program). We have minimized the amount of wheat and sugar over the past year. Has it been difficult? Ssometimes. Do I feel better for it? Most days definitely. Do I miss certain foods? Oh hell yes, the biggest one being Pizza. 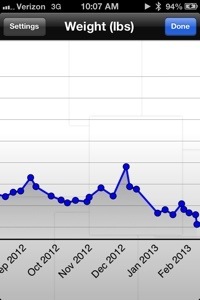 Here is a screen shot of the past year. 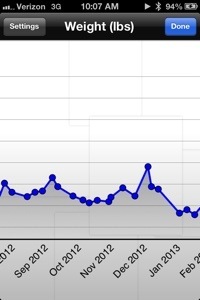 I can tell when we were on vacation by the spikes upward. To date I have lost 35 pounds from a year ago. Slightly more based on where I was at my heaviest. The Hubby is inching up to 30 pounds lost. So yes I guess the changes though in the beginning were rough and the scale was not very friendly in moving, sticking with the adjustment has been all for the better. Hmm seems I missed a week posting an update. Starting Avg was 145. My average is now 148. Last week we played Team Scared Straights we had a small deficit to make up and we did that and then some. We took 4 points and gave them 0 points which puts us in 3rd place with 17 points. This week is position round which means First place plays Second place, Third plays Fourth. We end up playing our friends who are on Team Fruits and Nuts.